The KVM (Keyboard, Video, Mouse) switch is a control unit that allows access to four computers from a single console (keyboard, monitor, and mouse). 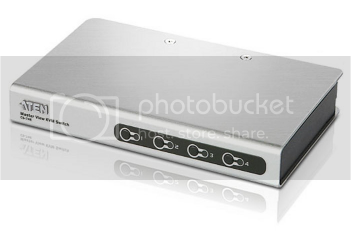 With its custom designed connectors, the significantly reduces the number of ports required for a 4 port KVM switch. The design features a custom SPHD-15 male connector for the keyboard, video, and mouse, and SPHD-15 female connectors for the cables that connect the switch to the computers. · One PS/2 console controls 4 computers. · Compact, modern case for convenient attractive placement. · Power on detection - automatically switches to the first powered on port. · Computer selection via front panel pushbuttons and hotkeys. · Superior video quality - up to 2048 x 1536; DDC2B. · Supports Microsoft IntelliMouse and the scrolling wheel on most mice. · Auto Scan function to monitor computer operation.